CKFR B Shift crews completed the Wildland Fire Fighting Refresher training, taught by instructor Lt Bill Green yesterday. Members reviewed the mobilization policy and deployment procedures, the Brush Truck at 56, as well as personal protective equipment. The training was capped off with a timed pack test run and cutting a control line with hand tools. At 5:21 this evening, CKFR crews responded to a 5th wheel trailer fire in the 10000 block of NW Pioneer Road in Seabeck. There were no injuries. The County Fire Marshal is investigating the cause. A small fire on Broadleaf was contained to it’s room of origin this afternoon. CKFR crews were also able to rescue Mocha and return her to her owner. There were no injuries. When a semi rear ended a pickup truck this afternoon, it was a miracle there were no injuries. The accident happened on the off ramp of HWY 3 North at Chico Way. The driver of the white pickup had just exited his vehicle when a semi rear ended it and pushed it into another parked big rig. Traffic was backed up for a long time as crews dealt with fuel spills, cleanup, and traffic investigators from KCSO responded. Crews responded to a second alarm fire this afternoon at a home on Peter Hagen Road. law enforcement had arrived first and advised incoming crews that the roof and second floor of the home were on fire. All occupants were out safely. The fire was extinguished and the County Fire Marshal was called to investigate the cause. 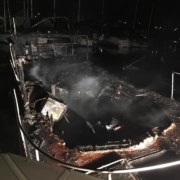 Central Kitsap Fire and Rescue units were dispatched to the Brownsville Marina for a boat fire in the early hours of February 24, 2019. Crews arrived to 2 boats and the pier well involved threatening multiple other boats. Fire was extinguished with major damage to two vessels. CKFR was assisted by Poulsbo Fire’s Marine 74 and Bremerton Fire units. Fire cause is under investigation by Kitsap County Fire Marshal’s Office. Central Kitsap Fire and Rescue, Navy Region Northwest and Poulsbo Fire units were on of a fully involved mobile home fire. No injuries reported. Central Kitsap Fire & Rescue crews responded to a residential structure fire off Seabeck Hwy today in a detached garage with an apartment. There were no injuries, the ire was extinguished and crews conducted overhaul to ensure there were no hot spots that could reignite. Central Kitsap Fire and Rescue crews were called to rescue a dog approximately 60’ down a 120’ high bank cliff. 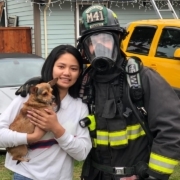 Crews from Central Kitsap Fire and Rescue, Poulsbo Fire, and South Kitsap Fire and Rescue, went down to retrieve Bubba, a 60lb pit bull mix, on rescue ropes. Bubba eventually made his way back up the slope under his own power. While Bubba was happy to see his family, he was less than appreciative to his would-be rescuers once back on top of the cliff and declined pictures.